A considerable amount of the Atlanta Metro population has been worried sick over their shrubberies, flowers, and yards with the recent drought and watering restrictions. Several have just put small buckets under their gutters to store up a little rain water to use during the weeks when it doesn't rain. 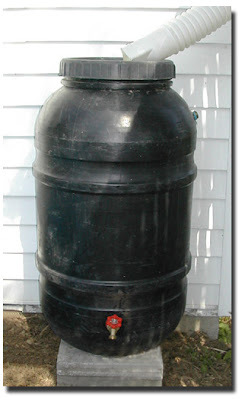 The city folks aren't familiar with an old fashioned remedy, rain barrels. There pretty simple to construct with a 55 gallon plastic drum. Connected into a gutter downspout, they make a good reserve of gardening water during dry spells. Put a faucet in the bottom and you can connect a hose and do low pressure watering. Now quit worrying about the landscape and get out and ride your motorcycle! You know, a rain collection apparatus has been on the long-term house to-do list for more than a year now. I just haven't gotten around to collecting any barrels or determining how I'm gonna design it. My property isn't exactly condusive to collecting water easily without cutting up my down-spouts.